Add watermelon, 2 Tbsp granulated sugar and lemon juice to a blender and blend until well pureed. Skim off foam then carefully pour into 10 popsicle molds filling each about 2/3 full. Sprinkle the chocolate chips over tops then using a popsicle stick, gently push down to immerse chips (push towards sides so you can see them once they freeze). Wipe sides clean as needed. Cover with the lid and insert popsicle sticks. Freeze 3 1/2 hours. During last 30 minutes of popsicles freezing, whisk together coconut milk with 1 1/2 Tbsp sugar until sugar has dissolved, chill 30 minutes (you want it to be a nice pourable consistency after chilling, not too thick. If you find that it is stir in 1 - 2 Tbsp cold water to thin. I recommend chilling it because you just don't want it warm or it will melt the watermelon layer when pouring in). 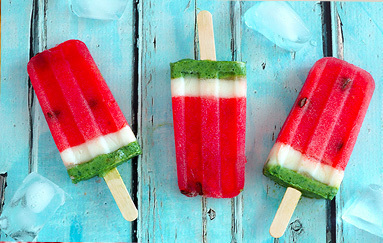 Remove popsicles from freezer, remove lid and carefully pour a scant tablespoon of coconut milk into an even layer over watermelon layer (again, it works best to pour it down the outside edge then wipe clean). Clean sides as necessary. Return to freezer, uncovered, and chill 45 minutes. Meanwhile, cut tops from kiwi and use a spoon to scoop flesh from kiwi while leaving skins. Transfer kiwi to blender along with 2 Tbsp granulated sugar. Pulse until well pureed. Force mixture through a fine mesh strainer into a bowl using a rubber spatula to remove seeds (at this point I mixed int just a tiny bit of blue gel coloring because mine weren't the best shade of green, so that's optional). Chill kiwi mixture 30 minutes.